Huey was found in northern Indiana during early winter, dodging cars on the interstate, where he had been unceremoniously dumped. He was taken to a kill shelter where he would have been put to sleep if he was not adopted right away. 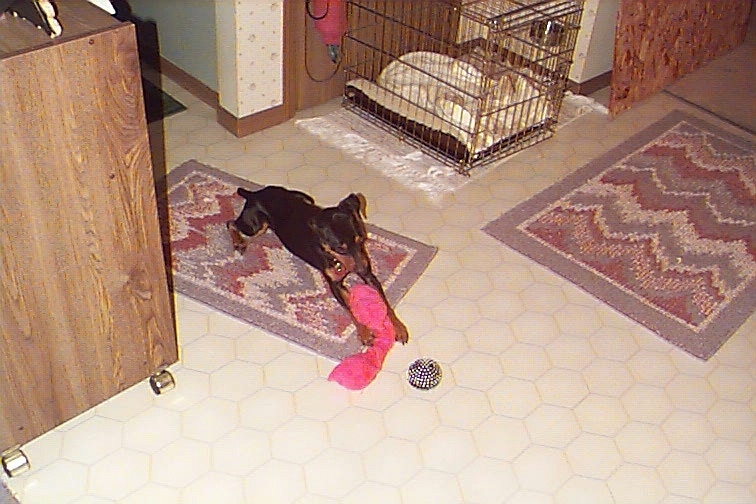 You see, Huey is larger than normal for a miniature pinscher. He was not adopted in the given time frame that the shelter allows. Pam of IMPS was called to the rescue. She saw his loving eyes and could not turn her back on him. Huey has the sweetest disposition and is very affectionate. She knew we would be able to find him a home that would give him the care he deserved. 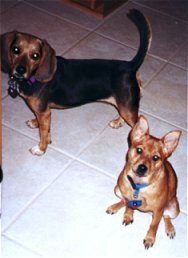 Huey came to our house in Louisville, Kentucky, to be fostered until he could find a permanent home. His foster sisters Zoë and Shiloh took to him right away, welcoming him to eat their food and sniff their toys. He got a bath and a good meal and was ready to play!!! 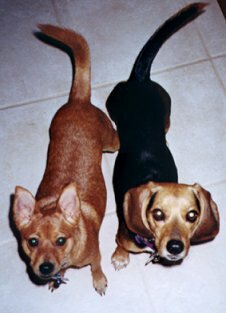 These are pictures of Shiloh the beagle and Zoë a min-pin mix, who both were rescued from shelters. 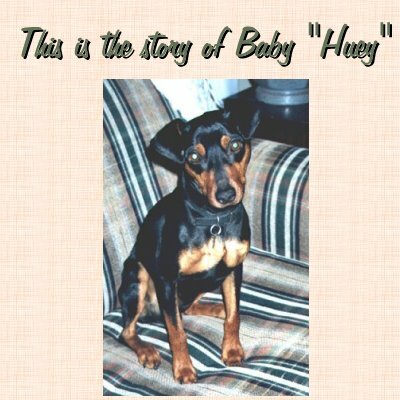 Huey was not house broken and didn't know how to behave in a home at first. He was also very sick with an upper respiratory infection and with a urinary tract infection. Through all of his vet trips and his treatment, he never growled or got the least bit snippy. He showed everyone that he really wanted to be a good boy. Huey had many people that wanted to adopt him, but one special person stood out! Huey needed a home that would give him lots of love and it was a tough decision. We knew Huey had found the right home when we met his new Mom and he gave her kisses right away! She is patiently teaching him how to behave and is giving him so much love that he won't let her out of his sight! This is his new brother Brandy!! 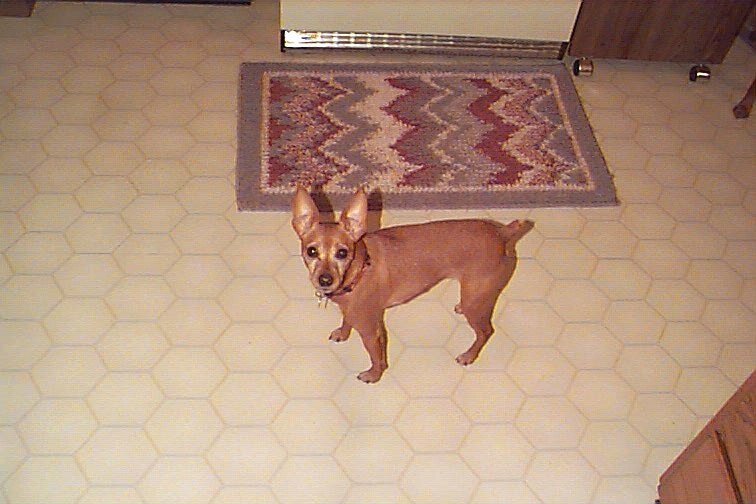 Brandy is also a Miniature Pinscher. 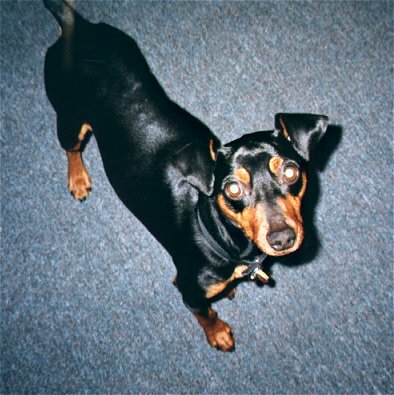 If you would like to adopt a Miniature Pinscher in your area, visit the Internet Miniature Pinscher Service -- IMPS.